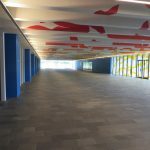 This year the EMS Annual Meeting will be held in the Technical University of Denmark near Copenhagen from September 9th to 13th. The aim of the meeting is to foster the sharing and cross-fertilisation of ideas, and to facilitate feedback between science and applications through the involvement of diverse actors in the meteorological and climatological fields. An additional focus of the 2019 Annual Meeting will be on Arctic and Antarctic issues and challenges. 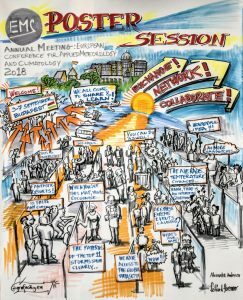 Graphic recording at EMS2018 postersession by Szilárd Strenner, Grafacity. Session programme and abstract submission. 12 new sessions have been included in the programme, many of which reflect the additional focus on challenges in the Arctic. Information on the additional Arctic/Antarctic focus on the EMS2019 programme can be found here. Information on the “Outstanding Poster Award” can be found here. Information on exhibition and sponsorship opportunities will become available shortly. Keep an eye on the conference website for upcoming information. Several support and award schemes are available for young scientists attending the EMS Annual Meeting. In order to apply you must submit an abstract with a view to presenting a poster or oral presentation at the conference. Further details are available here. Closing dates for applying for these awards are listed below. 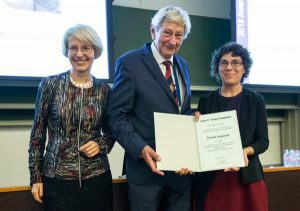 2018 Tromp Award recipient F. Aquaotta (right), with W. Rietveld and T. Cegnar. The closing date for nominations for the Tromp award for outstanding achievements in biometeorology is 30 April 2019. The selected awardee will be invited to deliver a lecture at a relevant session of EMS2019. Details on this award are available here. 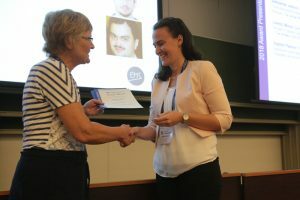 The winner of the Harry Otten Prize 2019 will be selected during the EMS2019 in Copenhagen. Applications for this prestigious prize is still possible until 10 March 2019. Details on the rules of the contest and additional guidance can be found at the Harry Otten Prize Website.